Aloha and welcome to our tropical home in paradise!! Our unit is conveniently located on the ground floor next to a koi pond and waterfalls. Enjoy your morning coffee on our private lanai while reading a newspaper and watching the birds attempt to dine at the koi ponds. Our recently remodeled kitchen renovations feature new appliances, recessed lighting, solid granite countertops, maple cabinets, a microwave oven, and floor tile. Eco-friendly filtered water is at your fingertips. The bathroom is also newly remodeled with a beautifully and artistically tiled shower, as well as a vanity cabinet with granite counter top. 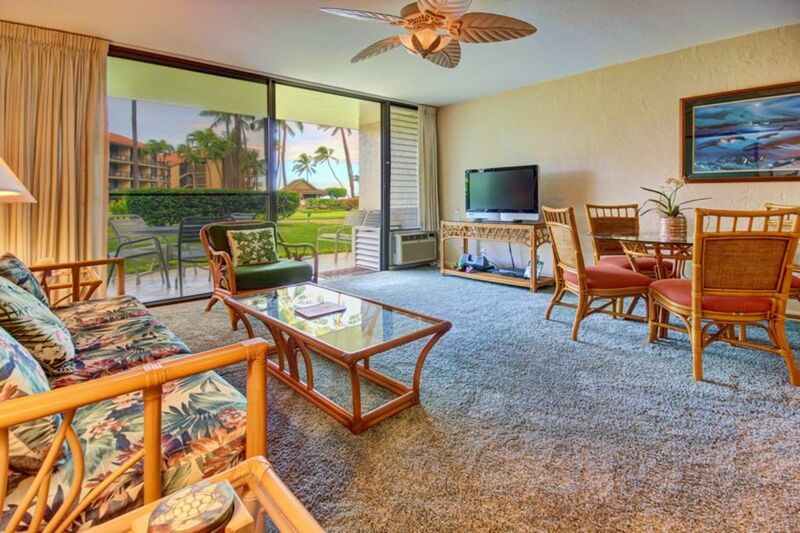 The unit is furnished in a light tropical décor with a touch of vintage and modern Hawaiiana. Before going to sleep, relax and curl up in front of our LCD HDTV and DVD player. The bedroom features a plush king size mattress and the sofa has a thick 8 inch mattress for the comfort of extra guests. Relax in our ocean-side cabana while your dinner cooks on our pool side grills. The whale watching and the views of Lanai and Molokai are breathtaking. The Papakea Resort is 13 acres of lush green plants, tropical flowers, and plumeria trees. Free WiFi available for your laptops, tablets, phones, and other tech gadgets. Kitchen and bath towels are always provided for our guests. The inside dining table seats four. For a more casual dining experience, two bar stools connect to the counter top. The outside lanai dining table seats four. An HDTV is provided in both the main living area and the bedroom. Our sound system includes an iPod dock. Our in-room book library has something for everyone. Feel free to take one and leave one. Check out the stash of beach toys, floats, and more in the guest cabinet. Snorkel gear is available in the guest beach cabinet. Three tennis courts are free for guest use. Two mini-golf courses on property are fun for the whole family. Two large, heated pools on the property are only steps from the beach. Papakea has two hot tubs; a perfect way to unwind. Gene's condo is very enjoyable and looking forward to year 10. Beautifully maintained Papakea ground floor unit. Immaculate, warm and inviting; this walk-out unit, with it’s west-facing outlook and warm afternoon lanai sunshine epitomizes the Maui experience; peaceful, quiet, relaxing; would welcome the opportunity to call it our island home again, and soon. Very nice property: comfortable, attractive and clean in a beautiful setting. Responsive host and reasonable price. Thank you! Mahalo for your very nice review. We are always glad when our guests have a great time. We had the best time and thoroughly enjoyed our stay at this resort! Lovely grounds and awesome views and everyone is so friendly. The unit we had provided all that we needed and was very clean nicely decorated. Easy access in and out by car or on foot for shopping, eating and beach access. Would definitely recommend to friends and family!! We will surely look forward to a return visit!! Mahalo for the great review, so glad you liked our little piece of paradise. We loved this condo at Papakea. It was furnished well, clean, convenient and had everything we wanted! The VRBO booking was easy and the owner contacted me via email with information. We would certainly love to come here again. All our guests may participate in free yoga and water aerobics classes throughout the week. A weekly tennis round robin game and golf putting tournament are also fun for the whole family--win prizes too! For our guests who are looking to relax, join us on Thursdays for a free afternoon maitai and snack party! If you would like to investigate and book excursions, dinner cruises, whale watching trip, and most all other forms of entertainment on Maui, contact the Expedia desk at Papakea in person or online at mauifun@expedia.com, and tell them unit C-108 sent you. 1-Papakea front desk is assessing $17.00 per night resort fee. This fee is payable to Papakea front desk at time of check in. 2- Beach towels can be rented at the rate for $4.00 per towel. Beach towels must not be taken off property; they are for use at pools and lounge chairs on property only. Please indicate at time of booking how many beach towels you would like. 3- Guest stays 14-27 nights will require mandatory linen exchange @$60.00, to be added at time of booking.